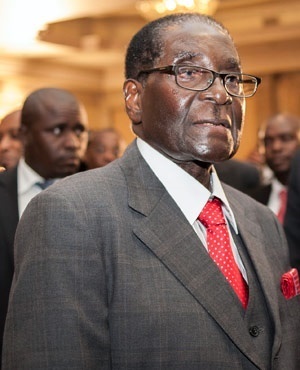 Harare – Zimbabwe's former president Robert Mugabe has reportedly said that the southern African country needs "the spirit of Zambia's Kenneth Kaunda" to bring back unity. According to notes seen by the privately-owned Zimbabwe Independent newspaper, Mugabe told African Union's Moussa Faki Mahamat during a courtesy call he made to the Mugabes' Harare mansion this week that the country was divided on "tribal and regional lines". Mugabe said that the country was in need of Kaunda's "One Zambia, One Nation" concept. During the meeting that was attended by senior government officials, Mugabe candidly told Mahamat that the country was divided after a military take over last November. Mugabe was removed from power after the military temporarily took control of the country on November 15 - as internal feuding escalated in the ruling Zanu-PF party over his succession. The takeover, which the army said was targeting Mugabe's corrupt allies, came days after the 94-year-old leader had fired then deputy president Emmerson Mnangagwa, who had strong military ties and was widely tipped as the likely successor. Mugabe's wife Grace had indicated interest in succeeding her nonagenarian husband. "This country is now deeply divided along regional and tribal lines; that is wrong. We want our own 'One Zimbabwe, One nation'. Harassing and intimidating people must stop; witch-hunting against people must stop," Mugabe was quoted as saying.